I have had some recent requests about how the condominium real estate market is doing here in the Twin Cities so I read over the data supplied by the Minneapolis Association of Realtors to get an update. There are a couple different categories to view to see the big picture, but I will warn you, the picture can be seen quite easily in the stats. Housing Supply Index : There are over 3400 units for sale right now, with 2285 of those being previously owned condos, up 6.3% from 2006. If you were to try and sell everyone of these, without adding to the inventory, it would take almost 11 months to do so. This time last year, the magic number was 7 months, so we have increased selling time by 40%! Home Sales : When looking at the real estate data and seeing what is being bought, condominiums do not top the list. In fact they are the least desired type of property right now, with closing this last year being 23% less than a year ago. The best thing selling right now is single family homes. Not good news for condo owners needing to dump their condo in downtown Minneapolis or St Paul. List Price vs. Sales Price : Any condo owner looking to sell really needs to take a hard look at what a unit is actually selling for and compare it to the original list price. When a unit hits the market now, a sale hinders on the entry list price. Price too high from the get go and most likely you won’t be selling for a while. Price it ahead of the market and you have a much better chance of getting rid of the unit. Currently, resales are only getting 94% of the original asking price. Average Sales Price : Real estate is local, even for condos, so when we take an average of the Minneapolis condominium market, we group everything together. So far this year, builder of new units are seeing the greatest drop in sales price, about 9.2%. The average new construction unit is around $259,000, while the average price for an owned condo is about $171,000. 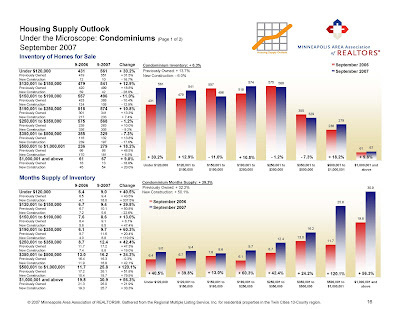 The graph above breaks down the inventory of condominiums into price ranges. If you want to check out a particular range, then this is the place to look. Condos in Minneapolis are the hardest real estate to sell. Builders increased new construction by so much that now there are too many for sale, and not enough buyers. Those that do need to sell because they bought at the height of the market when it was cool to do so, are now paying the price by not making any money on their unit. Some are breaking even, but others are selling for less than the purchase price or going into foreclosure. I hate to be the bearer of bad news, but such is the life of real estate. Things will get better once the amount of inventory has decreased and the doom portrayed by the media is gone. Just keep your chin up and hold for the next couple of years.